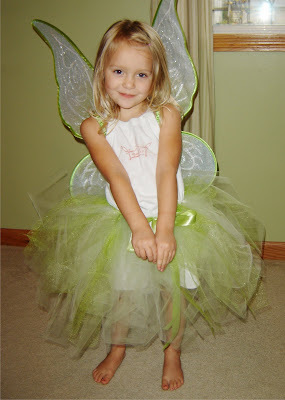 Of course my daughter would have to be some sort of princess or girly character for Halloween. Not that I objected but, I knew once my son turned 3 and he insisted on being a fireman that I could no longer dress them in adorable fuzzy cute costumes. This year Leyton will be Bumble Bee Transformer(I'll post pics of him next week) and Maddie Tinker Bell. 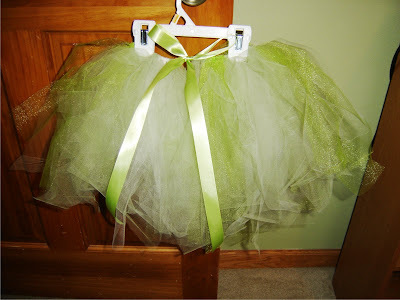 I came across this tutorial on YouTube on how to make a no sew tutu and thought I'm crafty...I can make this for Maddie's costume. Let me tell you this was so easy and super inexpensive. Fun too! She absolutely loves it! I was thinking I'd attempt to make the wings but, ended up buying these on the Disney store site. They light up, so how could I compete. Now I just have to figure out what I'm going to do for the top. Any ideas? I may attempt to sew one or dress up a shirt/tank top. I'll post pics when I have that figured out.